where to find electric car batteries? Navitron Renewable Energy and Sustainability Forum > General Renewable Topics > Inventions, Ideas, Innovation, Bodges etc > where to find electric car batteries? but... I keep looking at can;t find any batteries for sale at a decent price (less than thousands), it seams like there's people all over the world using old car battery packs for off grid use etc. but I've no idea where they get them? Re: where to find electric car batteries? There was some guy in Norway selling used E car batts some years ago. I believe he was dealing in them and sending them to the UK when nobody here could source them. Over 10 years ago, I was trying to source Forklift cells. I needed 60 cells. I was lucky to buy 2 packs from a broken down forklift. One pack was OK but the other was a dud. I then bought two forklifts. Both were running fine. but no brakes and the lifting gear was faulty. One was 72 volt and the other 48v. I just connected the 48 pack on the tynes to the pack in the 72v forklift and they worked like that for over 2 years before i built a proper place. My info is over 2 years out of date. Things would be much better now. You could advertise in a farming Magazine or free adds. Wanted E Van,. 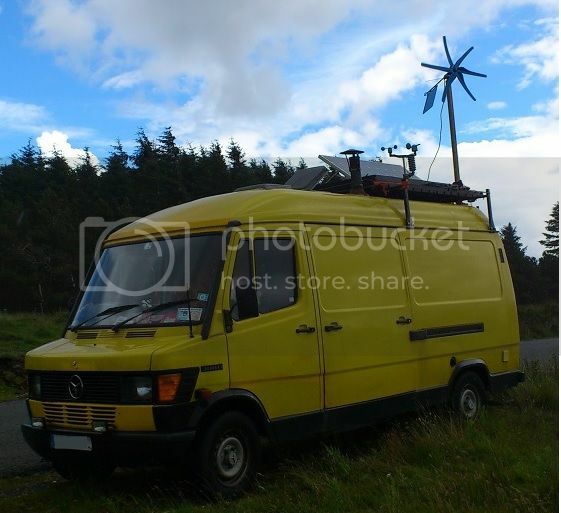 You could put solar pv on the transit roof and a small diesel engine underneath. I am not trying to encourage you to use fossil fuel but it would give you confidence to have a standby charger on board, Even a gas driven Petrol jobbie. These are very quiet and efficient. There are people there that build/repair EVs. I have seen adverts from scrappers even 2 Teslas at one local to me. I can imagine that scrappers do not want to take batts out of cars for safety. I have heard that the emergency services will not touch a EV until the experts pronounce safe! Due to the current trend in used EV battery demand I've noticed the market value of a used EV battery exceeds the price of a new 100% rated alternative. They cost thousands because they're valued at thousands. The price is nice but it would take a heck of a lot of laptop batteries to drive it. My benchmark cost for a new battery is the Pylontech's 2.4kWh which can be had for around £800 so that's £333 per kWh. That's a new battery that can be used independently with any system and has full BMS, i.e. short circuit protection, under voltage, over voltage, over temp and cell balancing. A new Growatt battery is at least that price, has BMS, but cannot be used on any system other than a Growatt, hence why I rip out the cells and use without BMS but with careful monitoring and charge no more than 80% or so. I have bought second hand 4.8kWh Growatt batteries for as low as £400 and as high as £700, so that's a price of between £83 and £145 per kWh. As I am not fully utilising the full size of them, arguably my cost per kWh is a little more, but then I might be gaining a longer life. Also I don't know how old they are and how much capacity has already been lost. Or even if they are completely faulty in some way. Luckily for me all have worked including one which had extremely low cell voltages, probably only SOC of 1% but it still accepted about 5.5KWh's back to full charge so they seem to be very resilient. So for me, for a second hand cell, I would not pay more than 50% of the cost of an equivalent Pylontech, i.e. say £165 per kWh. Interestingly, the scrapped 24kWh Nissan Leaf battery Scruff linked to is £160 per kWh so almost in line with my own personal view. 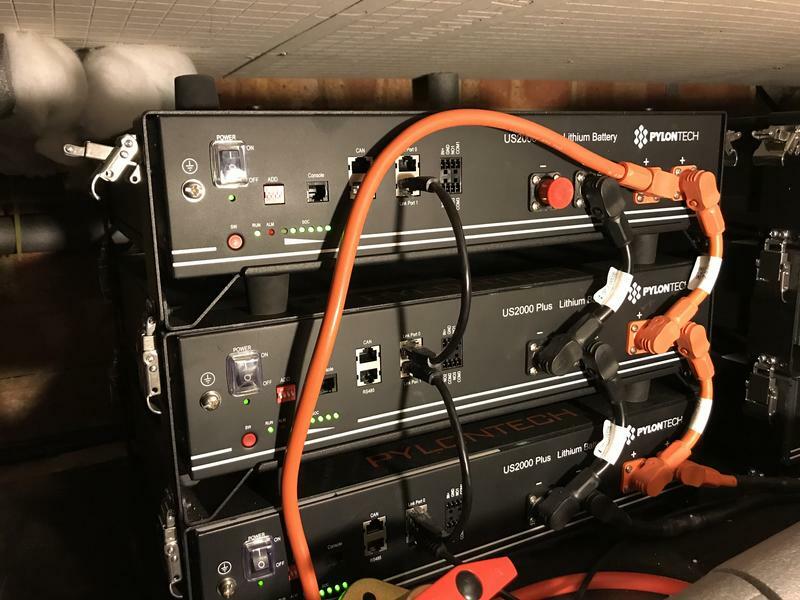 Pylontech works with anything if you run them as an independent battery looking after itself. I run them with my Sunny Island in parallel with the Growatts, when the voltage gets too high for them they just go into standby until the voltage drops back into their working range. Are you telling me that pylontech works without the RJ45 connection?! Yes it does, and you can still link 8 together so its all under one master control. I just took this picture now and the top left battery is the master running without any RJ45 connection to my Sunny Island.